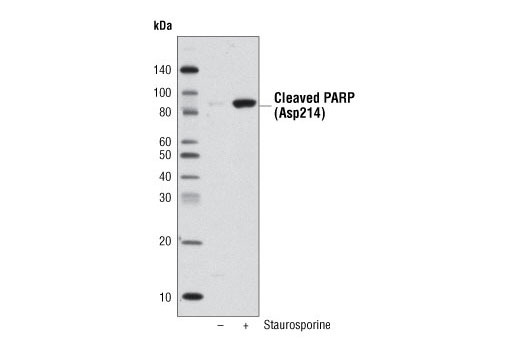 Western blot analysis of extracts from HeLa cells, untreated or treated with Staurosporine #9953 (1 μM, 3 hr) using Cleaved PARP (Asp214) (D64E10) XP® Rabbit mAb (Biotinylated) primary antibody and Anti-Biotin (D5A7) Rabbit mAb (HRP Conjugate) as secondary detection antibody. Relative fluorescence of biotinylated and non-biotinylated peptides determined by #5571 Anti-biotin (D5A7) Rabbit mAb (HRP Conjugate) detection using #7003 LumiGLO® Reagent and 20X Peroxide reagents. 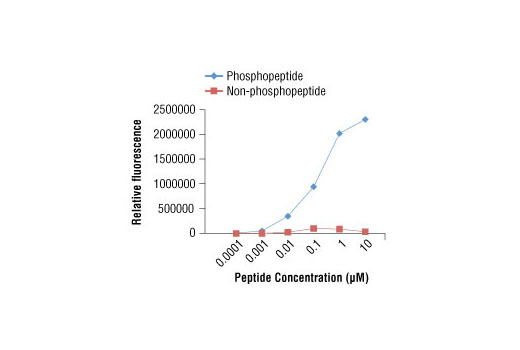 Chemiluminescent detection of phosphorylated and non-phosphorylated Met peptides with #4033 Phospho-Met (Tyr1234/1235) (D26) XP® Rabbit mAb (Biotinylated) in conjunction with #5571 Anti-biotin (D5A7) Rabbit mAb (HRP Conjugate). Supplied in 10 mM sodium HEPES (pH 7.5), 150 mM NaCl, 2 mg/ml bovine serum albumin (BSA), and 50% glycerol. Store at –20°C. Do not aliquot the antibody. Anti-biotin (D5A7) Rabbit mAb is conjugated to the carbohydrate groups of horseradish peroxidase (HRP) via its amine groups. 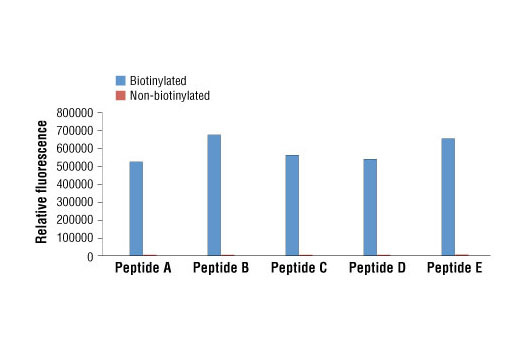 This product has been optimized to detect biotinylated primary antibodies. HRP conjugated antibodies do not require incubation with a secondary antibody. *Do not mix this antibody in solution with any Anti-rabbit antibody. Anti-rabbit antibodies will cross react with this antibody and could result in decreased activity of both Anti-rabbit and Anti-biotin (D5A7) Rabbit mAb. Anti-biotin (D5A7) Rabbit mAb (HRP Conjugate) recognizes biotin attached to proteins, peptides, oligonucleotides and solid matrices.